Academy Award-nominated political drama set against the backdrop of the Chilean national plebiscite of 1988. Forced to hold a referendum due to external pressures, the Chilean dictator, Augusto Pinochet, allowed both sides of the debate a 15-minute slot on TV to argue for and against his rule. 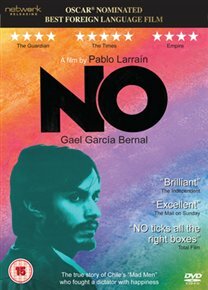 Rene Saavedra, here portrayed by Gael García Bernal, was the advertising executive who led the ‘no’ campaign and was forced to deal with pressures himself while doing so. Selling the campaign much like any other commodity, Rene succeeded in his goal which led to the liberation of Chile from dictatorial rule with 55% of the vote.